We are a team of earthlings, learned in the health care science of Ayurveda, here to assist you through your challenges. We take a 360 approach to bringing the body back to balance. In Ayurveda we believe that the body goes out of balance due to a build up of toxins through lifestyle choices. We go straight to the root of the problem instead of treating the symptoms. The primary way we balance the imbalance in the body is by changing our lifestyle. We invite you to empty your backpack and get some tools you can use NOW and adopt a lifestyle that’s more in line with your true nature. 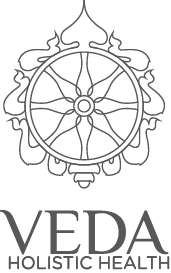 Serve yourself with us, Veda Holistic Health. What is your Dosha? Ayurveda states that all living and non living entities are made up of the five elements: Earth, Water, Fire, Space and Air. These elements combine in nature to create the humors of Vata, Pitta and Kapha. These forces unite to create different body-mind-digestion types. Our cooking classes are formulated using Ayurvedic principals of the three body humors Vata, Pitta and Kapha. These classes are tailored to your dosha which translates to three different types of metabolic rates: Consumption, absorption and storage. We have served thousands earthlings! Every product we recommend, we have tried and tested. Try them for yourself! We want to hear your experiences with them.